This electric powered scooter uses a simple kick start motor. This makes it easy for anyone to climb on and take off on their next adventure. You can also get there much faster than if you were walking thanks to the fact that it can travel at speeds of up to 10mph. To make it speed up, you simply twist the grip acceleration control on the handlebar. The motor is powered by a 24V sealed battery system. This scooter comes with a UL-Approved battery charger. This means that you do not have to purchase extra accessories. The initial charge will take approximately 12 hours. You should allow it to charge completely before you attempt to use it, even if the light turns green before then. Once the initial charge is finished, you should be able to charge it much faster. On a single charge you can expect the scooter to run for approximately 40 minutes of continuous ride time. However, if you are riding over rough terrain, quickly, you may end up with less riding time. It has a hand operated rear brake, a spring loaded kick stand, and an 8-inch pneumatic front tire. All of these features give you the ability to control your scooter with ease, which makes it great for smaller kids who want to take a ride on it. 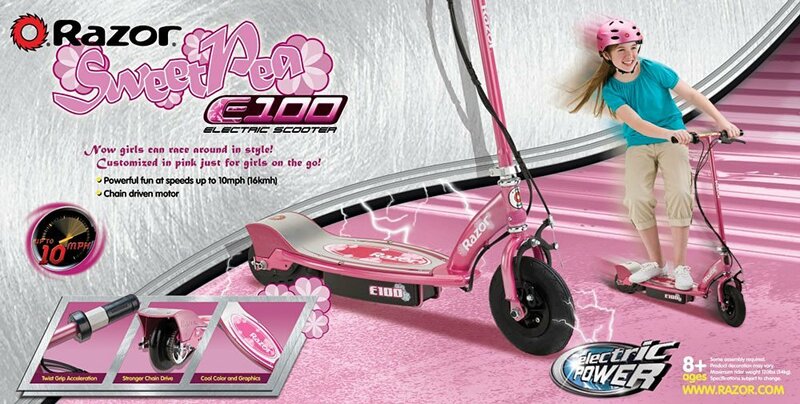 It is recommended that children be at least 8-years-old before they ride the E100. However, no one should ride it that is over 120 pounds. The E100 is also great for personalization when it comes to children. There are three color choices for you to choose from: SweetPea, Blue, and Pink. It does come with a 90-day warranty to ensure you do not have manufacturer defects to deal with. It is also lightweight at 31 pounds. It measures 43.5 x 8 x 17 inches. 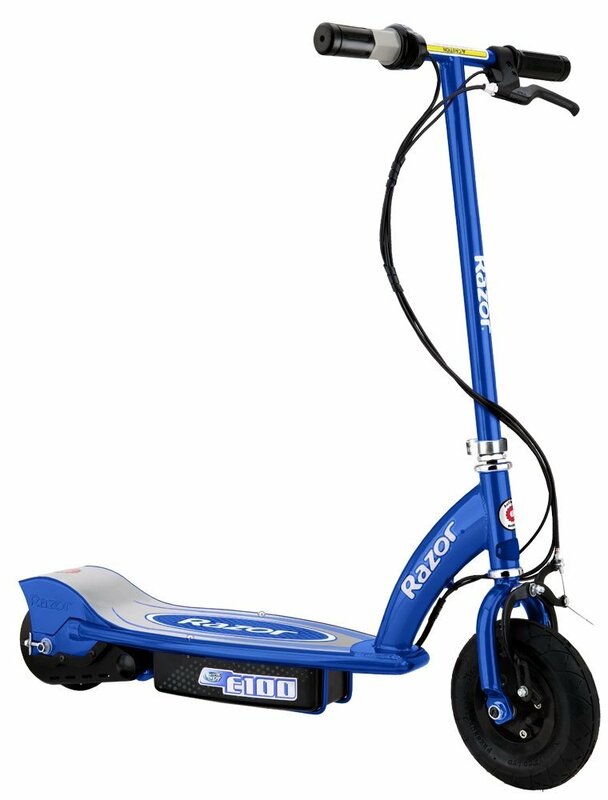 As you look through well over 600 reviews for this scooter, you will see why it has a 4.4-star ﻿﻿rating. Parents and kids love everything there is about the Razor scooter. They like the stability that the larger front tire provides, they love the battery life, the way it is built, the fact that it is fast enough to be fun, but not fast enough to be dangerous. 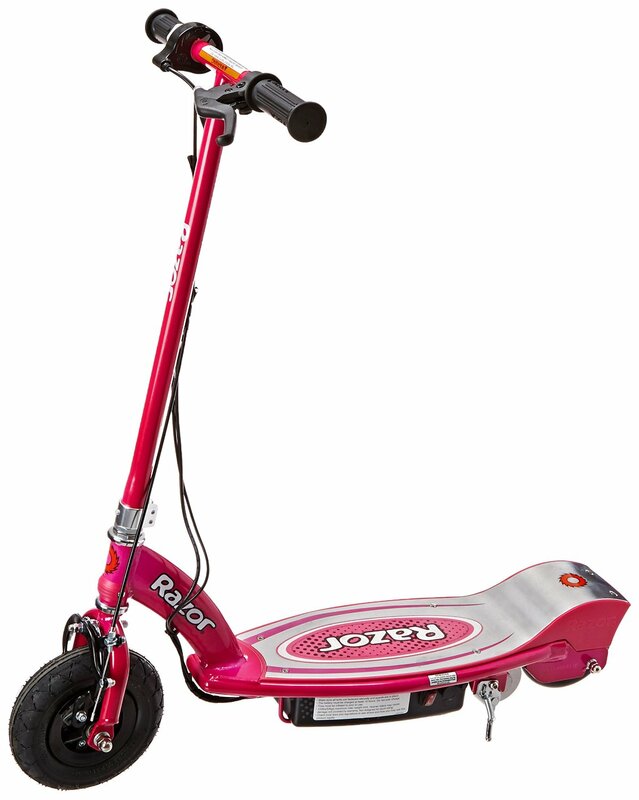 Most parents say that it is ideal for beginners who are just learning how to ride a battery powered scooter. Some people have purchased multiple scooters for all of the kids in their family and state that they have never had any issues with the way it performs. Is the Razor E100 Right for You? Copyright text 2018 by Scooter Smarter.